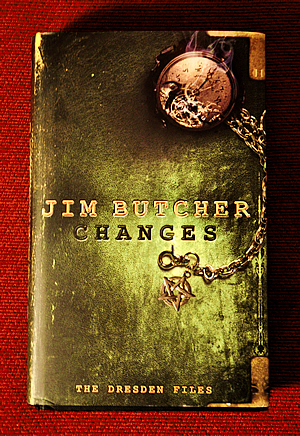 The Dresden Files, by Jim Butcher, is a series of now twelve books (the twelfth, Changes, will be published in early April) about Harry Dresden, a real-life wizard in Chicago. Harry consults for the Chicago PD to help solve crimes on the crazy side of weird, and at the same time fights an ever-increasing bunch of nasties – from the fey to vampires and mobsters to demon-possessed immortals. There are touches of noir, delightfully comic scenes, and many, many Wow! moments. This twelfth book brings more of the same – and something a little different. This time it’s more serious and more personal, because Harry’s daughter has been kidnapped. I really didn’t expect this book to be of the same calibre of the previous ones. After all, twelve books is a pretty lengthy run, and it wouldn’t be surprising if some of the magic and ingenuity had been lost along the way. Thankfully, however, Butcher does not disappoint with his latest instalment. I think this is my favourite so far. I laughed, I gasped, and I’m pretty sure I cried a little bit. This is a properly brilliant book and definitely worth the wait. For those who haven’t read the series, this is probably a good place for you to stop reading this review. I don’t want to give anything away. (And no, the info about Harry’s daughter isn’t a spoiler. It’s literally the first line of the book, and it’s the first any reader has heard about Harry being a father.) If you like a smart-arsed main character, if you like a supporting cast with life and realism, if you like growth and change then give this series a chance. You should also pick it up if you like “urban fantasy” – stories set in our world with an overlay of magic. The first couple of books are great, but from book 4 onwards they’re amazing, and I think they take the award for Rebekah’s Favourite Fantasy Series. Now: spoilers for the series (not the book) follow from here. Those of you who are up to date with the series, and eagerly awaiting the release of this next book: you will not be disappointed. I promise. The story opens with Harry getting a phone call from Susan telling him that someone has taken their daughter – a daughter Harry didn’t know he had. Butcher writes this really well, as Harry takes time to come to terms with the fact that he’s a father and that Susan hid this from him. (His interactions with Susan in this book feel very realistic, coloured as they are with anger and betrayal and disappointed love.) It turns out that the little girl has been taken by Arianna Ortega, Duchess of the Red Court, as revenge for the death of her husband (in Death Masks). There is, of course, more to it than that. Harry tries to get support from the White Council (no can do), the Grey Council (not right now) and Gentleman Marcone (not my problem) and finally is forced to make a deal with Mab so he can save his daughter – all of this while he’s under investigation by the FBI for acts of terrorism, and trying to avoid being killed by factions of the Red Court. All in all, it’s business as usual for Harry. You’ll be pleased to know that most of the usual gang makes an appearance in this book, with seriously neat stuff from a few of them (there was one great jaw-dropping moment which induced a little fit of giggles). We are also introduced to some new chaps & chapettes (all of whom I really liked, both baddies and goodies), and some of the familiar Evil Guys are back as well. And what about quality? Well, as I mentioned above, I think this is my favourite of the series. It is a darker, more serious book, and that’s not a bad thing. After all, change is good. The story cranks along at a great pace, and I didn’t want to put it down – even after I’d finished it. Right now, I can’t think of anything I didn’t like. The cool people are even cooler, the bad guys even badder, and Harry still can’t keep his mouth closed when he should. There will definitely be another book after this one, and it will be interesting to see where Butcher goes with Harry. Changes is a good title for the book –there is a shift in Harry’s character, and in the feel of the series. It’s more mature, I think. I’m really looking forward to reading it – and I think you will be too, once you’ve read this one. Changes is published by ROC on 6 April in the US, and will be released in the UK on 8 April by Orbit.